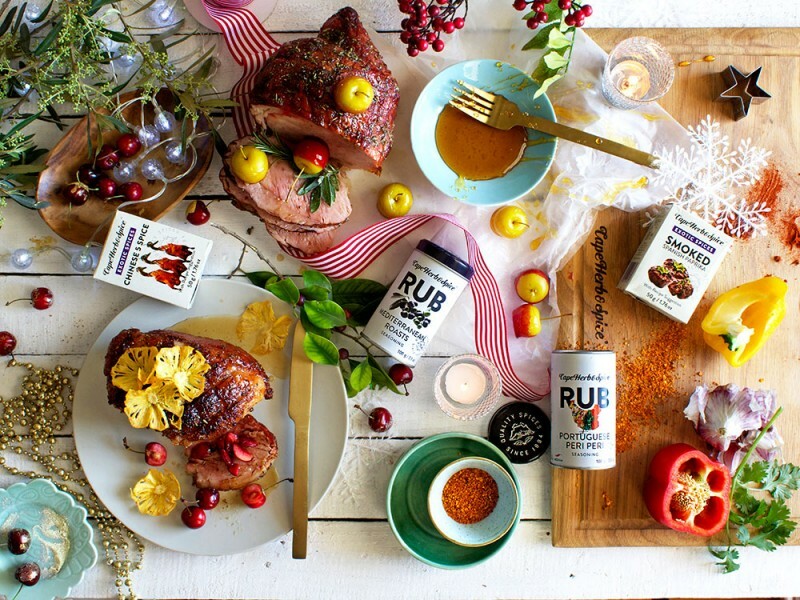 Cape Herb :: GIMME GAMMON THIS CHRISTMAS - A TRIPLE TREAT! Recipes GIMME GAMMON THIS CHRISTMAS - A TRIPLE TREAT! GIMME GAMMON THIS CHRISTMAS - A TRIPLE TREAT! Dressing up a gammon used to involve tinned pineapple rings and glacé cherries – so 1970. But don’t throw the baby out with the bath water – give this retro favourite a modern makeover with dried pineapple roses and fresh cherries. To make the dried pineapple roses, peel and thinly slice pineapple (a mandolin works best here). Place on a sheet tray lined with baking paper and place in a 110° C oven. Turn the rings over after 40 minutes and continue baking for another 20-30 minutes. Then, slip the pineapple slices into muffin moulds to cool and shape into flowers. Rub the gammon’s fat layer generously with Cape Herb & Spice Chinese 5-Spice Exotic Spice – get into those cuts too – then brush with melted orange jam or marmalade. Place back in the oven until gorgeously caramelised. Top with pineapple roses and fresh cherries. Why not dip those cherries into edible gold dust or glitter? It’s Christmas after all! The rosemary notes of our Cape Herb & Spice Mediterranean Roasts Rub Seasoning just beg for something apple-y to complement it. Apples don’t come much cuter than baby tinned ones, especially when turned into mini toffee apples. To make them, drain a tin of baby apples and place on kitchen towel to dry completely. Place 1 cup of sugar, a quarter cup water and a quarter teaspoon vinegar in a saucepan. Boil over medium heat until the sugar has reached hard crack stage (150° C.) You could add some red food colouring if you wish. Holding them by the stems, dip the baby apples into the caramel and place on baking paper sprayed with non-stick cooking spray to set. Rub the gammon’s fat layer generously with the Cape Herb & Spice Mediterranean Roasts Rub Seasoning, then brush with melted honey. Place back in the oven to caramelise and serve with baby toffee apples and a platter festively garnished with fresh rosemary and sage. Slice red and yellow peppers into thin strips and fry over low heat in extra virgin olive oil until soft. Add a clove or two of crushed garlic towards the end of frying, along with a pinch of Cape Herb & Spice Smoked Spanish Paprika. Add loads of fresh chopped coriander just before you serve it. Rub your gammon with our Cape Herb & Spice Portuguese Peri Peri Rub Seasoning, brush with melted apricot jam and into the oven it goes to caramelise. Serve slices of gammon topped with peppers.